All eyes are on America’s Third Coast, which has emerged as a modern incubator for new ideas in the epicurean and hospitality worlds. A century later, residents still don’t joke about the fire, as I did before I moved here last year, nor do they laugh about more recent headlines that plague the city and its nearly 3 million citizens. But there’s far more to Chicago than the statistics you read about in the papers. A revitalization of the maligned Chicago River is elevating the Loop area of downtown into a destination for both work and play. A bona fide dining and cocktail revolution draws coastal food snobs to this “flyover” state for indulgent weekends. Businesses from multinational corporations to start-ups are opening headquarters in the heart of the city, bringing with them creatives and futurists. And because the cost of living is so low for a major metropolitan area and the quality of living so high (for many, though surely not for all), people are able to follow their passions without the albatross of a desk job. I know a hedge-funder who now runs a meditation gym and a corporate executive who now manages an innovation festival. Culinary grads who love to make bread can open a storefront bakery in Logan Square and earn enough to own a home and raise a family. One woman actually just makes bespoke ice. Chicago is rapidly creating a culture of its own to rival—maybe even to surpass—any major city in the country. From a design-forward dormitory hotel to an upscale cafeteria inside a 1907 Burnham building, expect the unexpected on the Third Coast, a city reborn again and again. Since it opened, at the turn of the last century, the Peninsula Hotel has been a paragon of upscale service in downtown Chicago. But for many, the Rockwell Group–designed Langham Chicago outshines that grande dame in style and substance. Housed in a 1971 Mies van der Rohe building on the river, it welcomes guests with a ghostly Jaume Plensa sculpture in the lobby, then whisks them up to the second-floor reception area, where 500 pebbles of Czech glass hang from the ceiling and works by some 140 artists—many with Bauhaus connections—pepper the space. The 316 guest rooms adhere to Mies’s minimalist aesthetic, while the Travelle Kitchen + Bar delivers more than just inventive Med cuisine: seats at the bar overlook Bertrand Goldberg’s midcentury corncob-inspired Marina Towers. Hot on its heels in 2014—but perhaps for a younger crowd—came the Chicago Athletic Association Hotel, a retrofitted private men’s club built in the Venetian Gothic style in 1893. 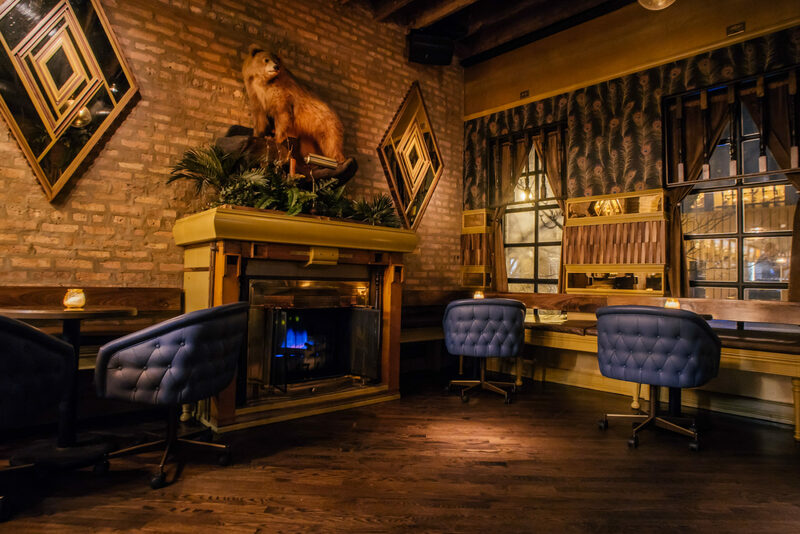 The landmark across the street from Millennium Park reopened with much nostalgia as a hipster haunt; the open-plan lobby is stuffed with Chesterfield sofas, wingbacks, and a forest’s worth of wood paneling. Designers Roman & Williams kept the sports-club vibe in the guest rooms (note the pommel horses repurposed as benches), but locals come for the cocktail cart in the Cherry Circle Room restaurant, shuffleboard and bocce in the Game Room, and Cindy’s incredible rooftop views (plus the recently introduced boozy popsicles). Naturally, there’s a Soho House, which draws the creative class to the Fulton Street Market area long before the area’s destination restaurants open for the evening. Expect to run into young designers from the nearby Google campus taking meetings and writers pounding away on their MacBooks on the club floor, the latter’s efforts supported by a well-dressed waitstaff toting almond-milk lattes (though the 60-foot rooftop pool also draws families). The 40 rooms have that haphazard retro look that makes Soho House lovable, and the programming runs the gamut from live bands to first-run movies in the screening room. It’s been hugely successful, perhaps inspiring the Ace Hotel, set to open in the fall, and the Nobu Hotel, which just broke ground, to swoop into the neighborhood. Farther afield from the density of downtown, a minor hotel renaissance is taking place. Grupo Habita’s The Robey took over a 1919 corner brick building where Wicker Park and Bucktown meet. Designed by the Belgian Nicolas Schuybroek Architects and Marc Merckx Interiors, its 69 rooms are largely spartan with splashes of color, but the swank lobby and rooftop bar (with a new cabana) make it an obvious hangout choice in this residential part of town. 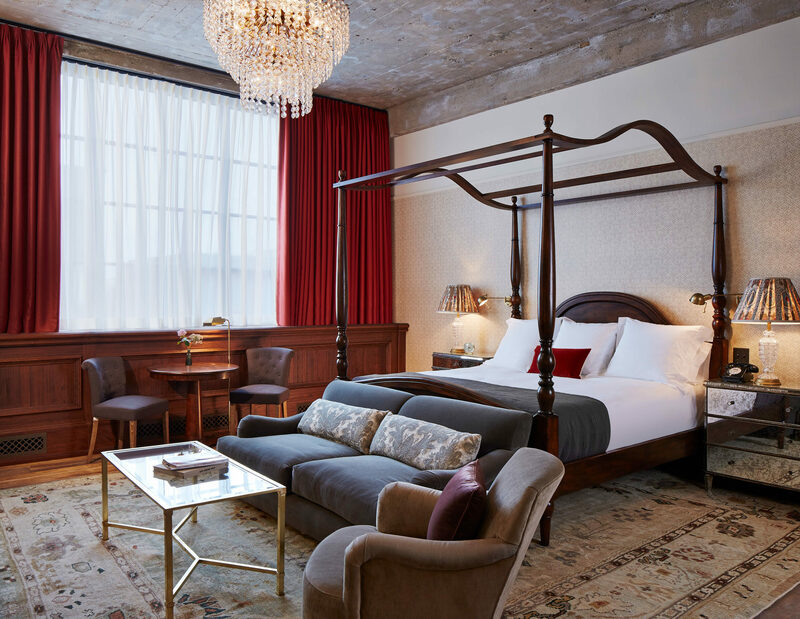 Cooler still is its next-door sister property, The Hollander, led by French studios Ciguë and Delordinaire, which brings the sharing economy to the hotel world. It allows guests to book a single bed in a communal room, connecting future roommates via social media beforehand. The dormitory-style Freehand in River North, also designed by Roman & Williams, has bunk rooms for groups, plus highly memorable cocktails courtesy of Broken Shaker Chicago by Bar Lab, a Miami import. Then again, if your ideal evening includes exceptional food and drinks, consider dining at Longman & Eagle—the American-fare establishment that put the Logan Square neighborhood on the map—then retiring to one of six charming guest rooms upstairs. Note that the $95 price tag does come with a caveat, stated clearly on the website: “Our rooms are above an occasionally raucous, whiskey-fueled tavern, so if you’re extremely sensitive to noise, you may want to consider the overall environment before booking.” Gotta love that Midwest earnestness. Chicago embraced the cocktail-culture revolution with gusto, and you’ll stumble upon brilliant innovations all across the city’s distinct neighborhoods. In Lincoln Park, The Sixth’s Benjamin Schiller uses a $7,000 machine to freeze ice so clear it’s nearly invisible, and imbues his cubes with whimsical ingredients: Trix cereal flavors for the Silly Rabbit, a delicate rose still on its stem for the gin-based Doris. Meanwhile, star chef Grant Achatz applies molecular gastronomy to mixed drinks at West Loop’s Aviary, where a truffle might occupy the bottom of your tumbler of Negroni. 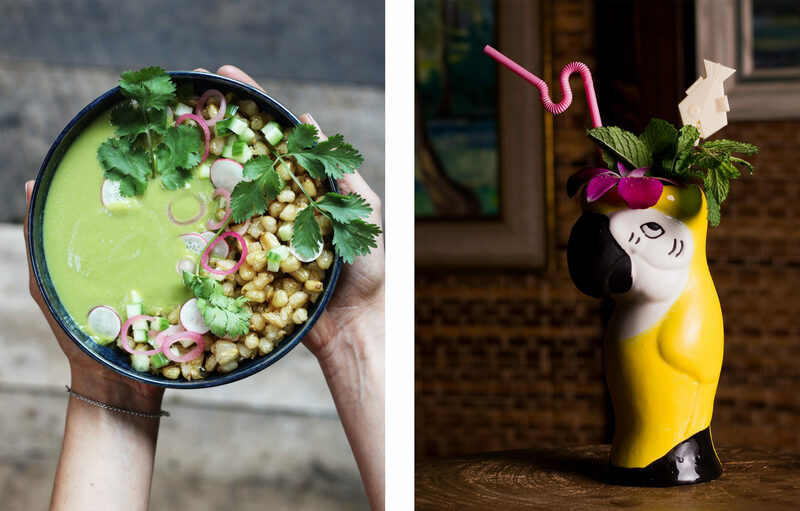 Over in Logan Square, the gin-bar pioneers behind Scofflaw inaugurated a 1970s-inspired “fern bar” called Heavy Feather, while nearby Lost Lake, designed by Land and Sea Dept., takes on a modern tiki theme. For a more buttoned-up motif, head to Vol. 39, inside the new Kimpton Gray Hotel. A classic law library theme informs the look as well as the drinks: Bartender Jess Lambert presents her killer Old-Fashioned in period glassware, sweetening the Armagnac with barrel-smoked Demerara sugar. But food is where this city truly shines. What was once a meat-and-potatoes town is now home to hygge-happy Danish cuisine at stripped-down Elske, where the wallpaper is inscribed with sketches by Anna Posey, one half of the husband-and-wife chef team. 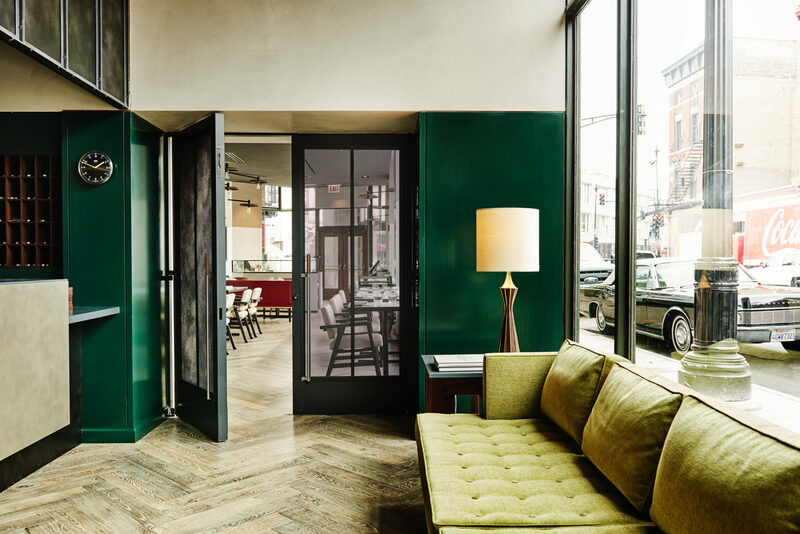 There’s also vegetable-forward gastronomic fare at Bad Hunter, a well-lit, neutral-hued space fronted by vintage French doors; and nouveau Chinese at chef Stephanie Izard’s Duck Duck Goat, whose layered approach to Chinatown design by Avroko matches Izard’s global approach to the menu. All three happen to sit on or near West Randolph Street, the old meatpacking area in the West Loop, and now a veritable Vegas Strip of “best of” dining spots. 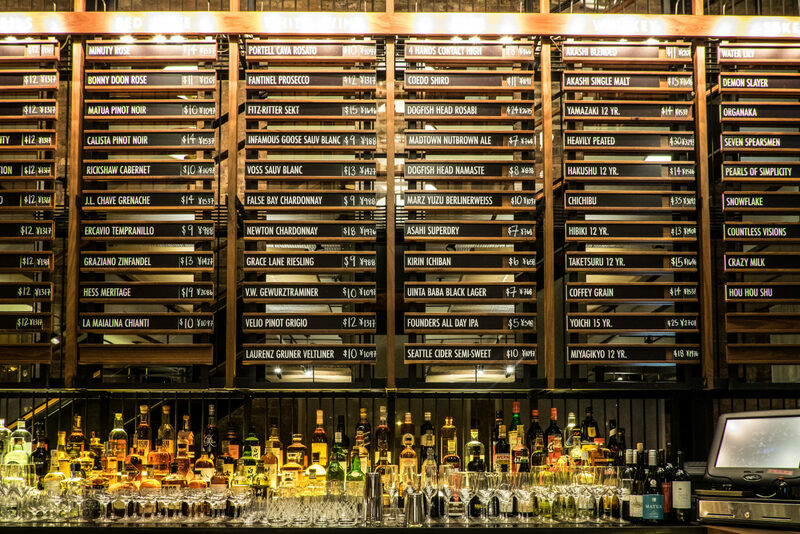 Walk along its wide boulevard lined with warehouses, and you’ll stumble upon more than a dozen establishments that deliver on atmosphere, crowd, and cuisine—everything from Paul Kahan’s wood-planked sophisticate Avec to Brendan Sodikoff’s pumping Maude’s Liquor Bar. Elsewhere, powerhouses such as Boka Group continue to reinvent familiar concepts: Intro Kitchen, in bourgeois Lincoln Park, welcomes a new chef every month, while the izakaya/robata Momotaro shows off a drink list on signage resembling a train-station schedule (a design also courtesy of Avroko). Revival Food Hall brings together more than 15 of Chicago’s top chefs for an upscale cafeteria that has a stall for every cuisine, from tacos to poke bowls, on the ground floor of a revitalized 1907 building—now aglow with vintage tiles and filament bulbs. Sarah Grueneberg turns boring pasta into pure joy in a bowl at Monteverde, and the world is taking notes (she just won Best Chef, Great Lakes, in this spring’s James Beard Awards). Upstairs at the ivy-clad Smyth + The Loyalist, alums of Charlie Trotter and Alinea put a fresh spin on 5-, 8-, or 12- course processions of outrageous combos—egg yolks soaked in salted licorice with frozen-yogurt meringue; brioche donuts with aged beef au jus—sourced from a local partner farm and served on plates by ceramist Lilith Rockett, who also fabricated the lighting fixtures. In the subterranean bar await ambitious cocktails such as Coco Lamate, an earthy-sweet mash-up of yerba maté gin, saffron, honey, lemon, and grapefruit bitters. The Windy City lays claim to the second-largest art museum in the country, and, like its bigger sister, New York’s Metropolitan Museum of Art, the Art Institute of Chicago deserves more than one day for touring its 11 curatorial departments. It expanded its footprint nearly a decade ago with a remarkably serene, classically proportioned addition by Renzo Piano that sits in quiet contrast to its bold neighbor, Frank Gehry’s swooping band shell, at the other end of the lakefront Millennium Park. The already robust collection was further enhanced by a vast donation of pop art in 2015, and this year Chicago architect Dirk Denison redesigned Terzo Piano, the restaurant he originally created atop the Modern Wing. The open-plan aerie’s floor-to-ceiling windows overlook the muscular skyscrapers of Michigan Avenue, and the terrace is appointed with David Adjaye’s Washington Skeleton chairs for Knoll. The Josef Paul Kleihues–designed Museum of Contemporary Art is often cited as the world’s largest structure devoted to postwar works, but even without that superlative it would be a remarkable center of culture. Hosting dozens of “first” exhibitions, it continually breaks records with crowd-pleasers such as the “David Bowie Is” exhibit, and daring shows focused on diverse subjects such as Kerry James Marshall, the Bouroullec brothers, or simply “youth.” This summer, as part of a repositioning of the whole institute, chef Jason Hammel will debut the ground-level Marisol, an immersive dining experience created in conjunction with British artist Chris Ofili. For a diversion away from the mainstream attractions, check out the Renaissance Society. Combining the academic rigor of museums with the cutting-edge ethos of a gallery, the curators frequently highlight emerging artists long before most institutions dare to. With artists such as Mickalene Thomas on its roster, Kavi Gupta operates on a level above most of its local peers. As one would expect, its location—in the industrial-edged West Loop—puts it at the epicenter of all that is contemporary and on-the-cusp. 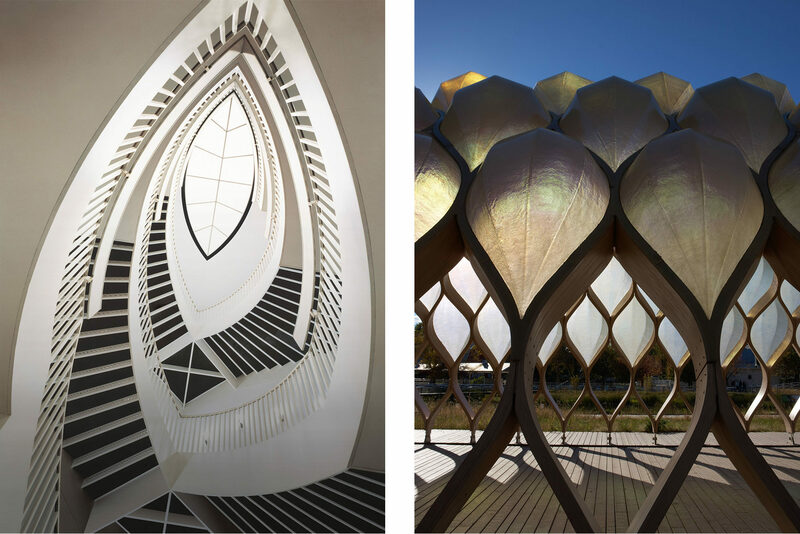 And for innovative, forward-thinking design, Volume Gallery is a must-visit. There’s no shortage of ways to engage with green space, which is often ornamented with public art. 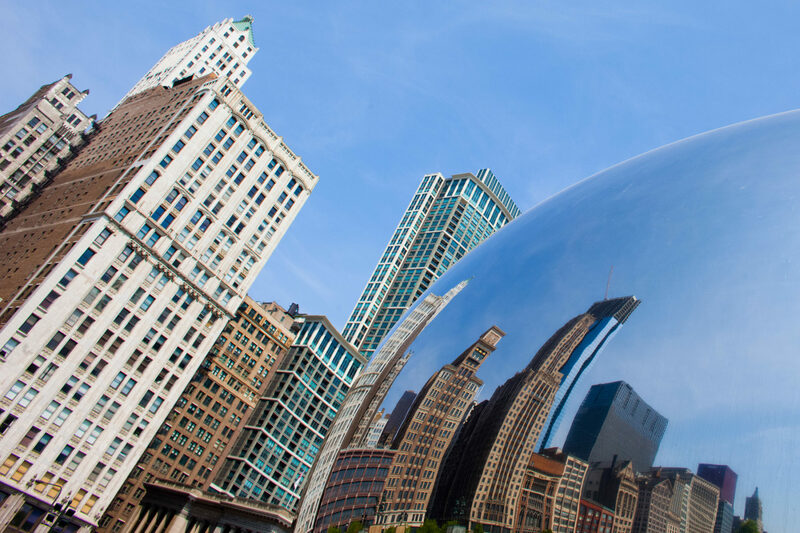 Millennium and Grant Parks, considered the front lawn of Chicago, offer more than just a pretty picnic spot: Anish Kapoor’s reflective “Cloud Gate” (nicknamed “The Bean”), the Jay Pritzker Pavilion, and Frank Gehry’s band shell are among the most photographed spots in town. The Magnificent Mile is the obvious destination for luxury shopping—the section of Michigan Avenue that stretches from the Chicago River to the Gold Coast is one of the most expensive swaths of retail real estate in the country. Even if Burberry and Barneys aren’t your thing, you can still get a design fix by looking up: The exoskeleton of the John Hancock Center, the glassy tiers of the Trump International, the neoclassical Wrigley Building, and the Gothic Revival Tribune Tower all share the address. Also look down: In spring and summer, the meridian is abloom with a riot of flowers looking for their own slivers of sun. Ikram Goldman, however, is the sun in Chicago’s fashion solar system, and her Gold Coast boutique reflects her incredibly keen eye. She famously dressed Michelle Obama, so there are certainly loads of highly wearable color-block shifts to sort through at Ikram, but you’ll also find sartorial looks by Junya Watanabe and Rodarte. Robin Richman appeals to a similarly moneyed and independent woman, and her Bucktown boutique displays unusual finds as if they were on loan from a gallery. Cross your fingers that you discover the Japanese knitwear she sells before the rest of the world does. 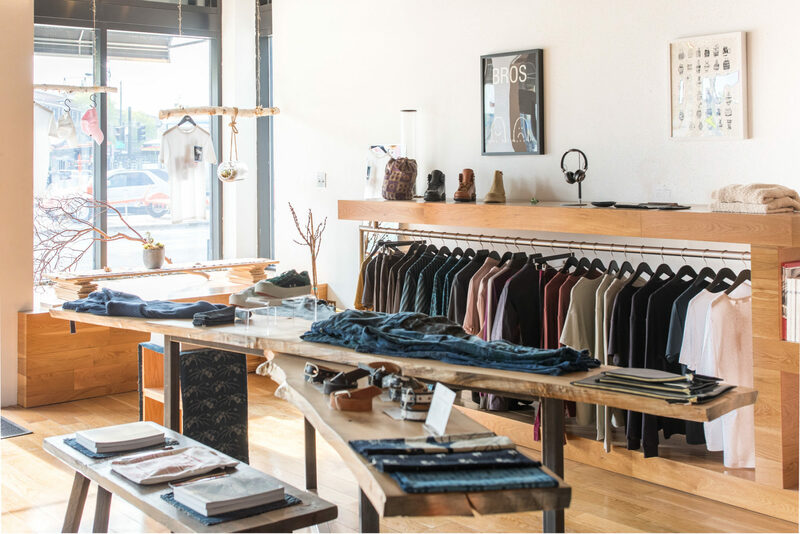 Then there is Blake, a River North mainstay that stocks fashion darlings like Dries Van Noten and Wales Bonner, and VMR, whcih sells women’s clothing by designers you’ve never heard of—but will soon become devoted to. Debonair men aren’t totally out of luck here. Optimo sells custom hats that guys have been known to board planes to purchase. Cop the rest of the outfit at Meyvn, which will suit you up in Karhu sneakers, Eidos pleated chinos, and even grooming cream to fix your ’do just so. At Virgil Abloh’s RSVP Gallery, patrons are encouraged to go extreme, either in Raf Simons print parkas or 11 by Boris Bidjan skinny jeans. It’s not typical to spy guys in town sporting some of those styles, but as with neo-tiki bars and truffle-enhanced cocktails, you never really know what the next big thing in Chicago will be.